This is a cut loose pattern that uses 2 creative grids tools. 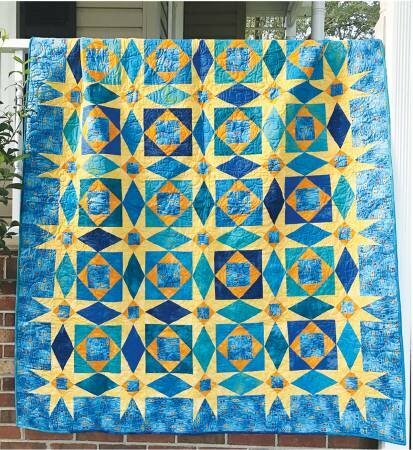 This class will cover the construction and use of the creative grid tools to make this quilt top. The finished size of this quilt top is 64 in x 76 in. The Multi-Size 2 Peaks in 1 Triangle ruler combines the angles you need to create triangle in a square blocks which requires a two to one ratio. The unique keyhole cut-out allows you to rotary cut both angles with one tool. Cut the tall, center triangle from strips measuring 1-1/2 inch – 6-1/2 inch with no waste. The markings on the ruler show the finished size as well as the strip width required. Cut the side triangles with the other triangle. Again, the markings on the ruler show the finished size as well as the strip width so you don’t have to do the math. Create 4 inch or 8 inch square on square blocks. No calculations needed - all the cutting measurements are printed right on the tool! Trimming each round as triangles are added creates perfectly square, uniform blocks. The popular Snail's Trail block is now easier than ever - simply change the colors of the triangles!